PLACEMAKING – It’s on the tip of everyone’s tongue these days. Is it the job of city planners, retailers, investors, community leaders or the public at large? Simply put, placemaking is an all rounded approach to the planning, design and management of public spaces. The ideal is to create vibrant public spaces that offer wellbeing, pleasure and inspiration. It’s worth noting that many of the world’s iconic places are public spaces. A research study by CBRE reports that when placemaking is done well, real estate value is enhanced. The 4 key results would be the improved image of an area, creation of a new destination for visitors, residents & workers in the vicinity, addition of versatile public spaces and the definition of newly developed areas. In light of this conversation, the Urban Land Institute and CBRE Ireland launched the inaugural ULI IRELAND - EXCELLENCE IN PLACEMAKING AWARDS. The goal is to reward best practice in placemaking, a pat on the back to organisations and communities that make genuine efforts to improve their local communities through the initiation of projects that add to the public realm and make these areas better places in which to live, work and play. We chat with one of our distinguished judges for the awards, Màiri Henderson, who is an Associate Director at McCutcheon Halley. Màiri joined McCutcheon Halley 17 years ago and has played an integral role in their development as a leading planning practice in Ireland. CBRE: Right off the bat, what do you perceive good placemaking to be? MH: Good placemaking starts from the desire to create an environment which is fit for its purpose and where people feel at ease, whether that is the creation of a new mixed-use community, a working environment, or a public recreational space. Good placemaking engenders a sense of a unique place, reflecting local qualities, responding to its surroundings and allowing people to live, work, interact and relax positively, promoting healthy living and social inclusion. Excellence is about responding effectively to the challenges of development in today’s economic and environmental climate, providing solutions to the demands of a growing population, affordability and sustainable living, while promoting inclusivity. CBRE: What in your opinion are among the best examples of placemaking you've seen globally? MH: Some of the best examples of placemaking I have seen are those which use spaces innovatively, adding value to their function, or a ‘breathing space’ within an urban context. For example, in Copenhagen the Opera House has a beautiful floating roof over the water front, which has recently been used for international diving competitions, or the Amager Bakke Waste to Energy Plant (Copenhagen), which opened in 2017, incorporating a ski slope and 85 climbing wall. Both are examples of how major public, or infrastructure investments can provide a dual community use. At the other end of the investment scale, one of the best examples of placemaking I have encountered is the sensory garden, within Aberdeen City’s Victoria Park. Victoria park is a small city park and the sensory park was first developed in the late 1960s. The sensory garden has continued to evolve, providing easy mobility access and with a focus on planting to be enjoyed by their different scents and textures. CBRE: Is placemaking only for large public spaces? MH: Certainly not, small spaces are also able to be excellent at placemaking. Barcelona for example - while the city has some impressive larger public parks, it is the use of small squares and parks within the city, that are among the best examples of placemaking. These parks are small scale, but provide an oasis within the heart of the city, designed to provide spaces for all ages to meet and relax. CBRE: Why are you excited about being involved with the ULI Ireland- Excellence in Placemaking Awards? MH: It provides an opportunity to recognise and showcase projects which go beyond the norm, to develop spaces which respond to their context and contribute positively to the social and economic vitality of our communities. The award criteria is wide and I am looking forward to seeing the range of projects that will come forward and will contribute to the conversation on what constitutes excellence in the design of places. The inaugural Irish awards, provides the opportunity to showcase inspiring developments that make people feel at ease within the built environment. 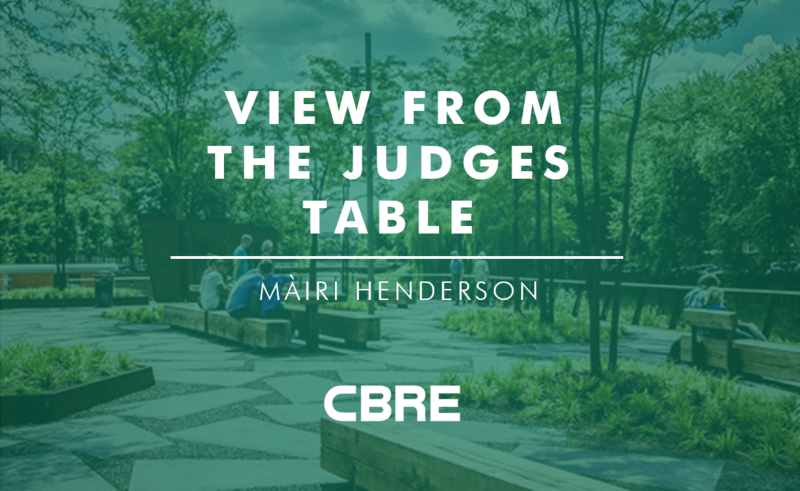 CBRE: What will you be looking for in particular as a judge in this competition? MH: I will be looking for projects that, regardless of scale, create a unique sense of place and help to anchor people in their community. I will also be looking for projects that have been developed in a collaborative manner, enhancing community interaction and creating a sense of ownership and pride over urban spaces. Màiri has a BA (Hons) Housing from the University of the West of England. She is a member of the Royal Town Planning Institute and the Chartered Institute of Housing. She provides focused and steady guidance on complex development projects, from framing a supportive policy context; through project inception; navigating the planning and environmental consent process; and supporting clients in meeting compliance requirements to deliver successful and viable developments.